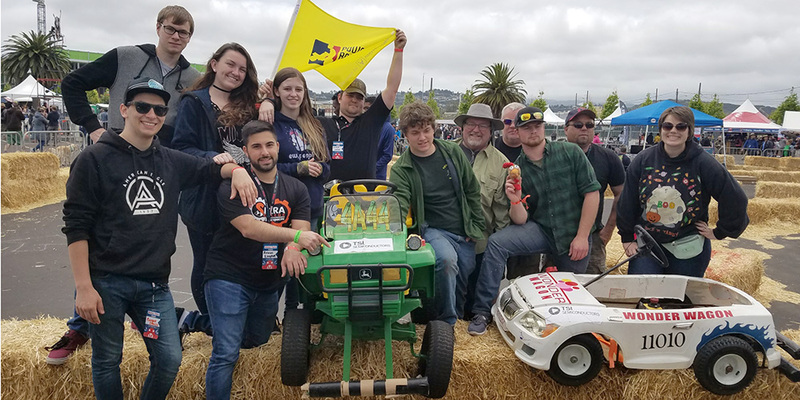 During RoboGames, the world’s largest robotic completion held in Pleasanton CA on April 28-29, a Sierra College Robotics Club student team competed with an Autonomous Firefighter robot and won second place. At this same event, another team representing the Sierra College Robotics Club team competed with a 120-pound combat robot. There were 13 registered teams competing in the firefighting event, including teams from Indonesia, Egypt, Poland, Germany and the United Kingdom, according to Tony Osladil, Mechatronics Instructor, Sierra College. “The Sierra College Robotics Club team included one Computer Science major and two Mechatronics majors,” said Osladil. “During the three month period prior to competition, they worked very intensely over many evenings and weekends.” Mechatronics is a combination of mechanics, electronics, pneumatics, and hydraulics under computer control used in ATM’s, ski lifts, water treatment systems, medical lab equipment and automated manufacturing – as well as robots. According to Dicus, there are growing opportunities for skilled employees to work for manufacturers in the Sacramento region. “There are many career openings in product design, maintaining robotic equipment, engineering and fabricating products used in healthcare, aerospace, utilities and automotive industries as well as many familiar household products,” said Dicus. The team already has plans for next year. “The Robotics Club is a welcoming bunch of people,” said Adriano. “I’d encourage other students to join – all majors are welcome to get involved. We are planning to compete in the autonomous robot competition again and the club participates in other events such as the Maker Faire in the Bay Area.” You can see the students’ robots at the Rocklin Mini Maker Faire on October 6, 2018 at Sierra College. The summer session of Mechatronics 0001 - The Science of Electronics begins June 11 in Rocklin and registration is open for Mechatronics classes in the fall semester at all three campuses in Rocklin, Nevada County and Tahoe-Truckee. Learn more about Sierra College Mechatronics at http://www.realskillsrealjobs.com/, Sierra College Advanced Manufacturing at https://www.sierracollege.edu/academics/divisions/cte/advanced-manuf.php and SVMI at Valley Vision at https://valleyvision.org,/.